To see Melton from the railway line, it is not the most enticing of places, but be reassured that it has not decided to challenge Great Blakenham for the title of Suffolk's most industrialised village. Once you get beyond the detritus of riverside industry, it is a very pleasant place. You could argue that Melton today is an industrialised suburb of the town Woodbridge, but the village street still feels reassuringly rural, especially since the bypass was built. Until ten years ago, this thundered under the weight of traffic to and from the American bases, on the other side of the River Deben from here. Now, the Americans are gone from East Suffolk.And it isn't just the madness of the Cold War which has touched Melton. For an older generation of Suffolkers, Melton was the home of the East Suffolk county lunatic asylum, later St Audrey's Hospital, which along with the railway provided 19th century jobs here in abundance. 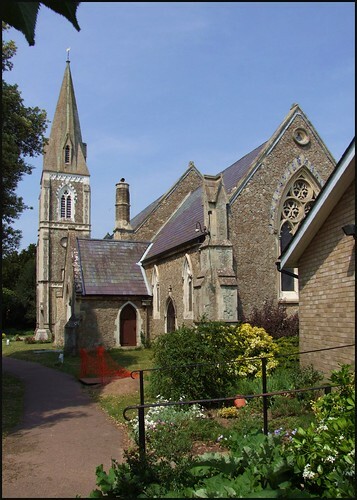 As the village expanded towards Woodbridge, it left its little medieval church alone out in the fields; rather than spend their money on a restoration to enlarge it, the Parish decided to build a completely new church, in the new heart of the village. This happened more frequently in Norfolk than it did in Suffolk - St Andrew is really quite unusual. But I must say that this is not a building I admire. The architect was Frederick Barnes, best known for those wonderful railway stations which he built on the line between Ipswich and Cambridge, but the Kentish Ragstone he used here is wholly inappropriate for a Suffolk village. Be that as it may, the new St Andrew is a well-used, well-loved church, and there is much evidence of this inside its rather dimly-lit interior. The great feature of the interior is the late medieval font which was brought here from the old church. It is one of Suffolk's 13 seven sacrament fonts, one of only ten that have surviving imagery. It is slightly more battered than many of its companions, but it is particularly interesting for its unique 8th panel, which shows the martyrdom of St Andrew. It also has a characterful 'last rites' panel, with a chamberpot and a pair of slippers under the dying man's bed, as at Badingham. This font must have been one of the last of the series; the vinework under the bowl is reminiscent of that on the font at Walsoken in Norfolk, one of the very last fonts to be made in England before the Reformation intervened. As was fashionable, the church has a long, low north aisle, its darkness alleviated by the dormer window which lights it. There is some good turn of the century glass, especially the Kempe window to St Andrew and St Etheldreda flanking the risen Christ. She is here because this parish was in the liberty of St Etheldreda - that is to say, the living was in the gift of the monks of Ely, and this parish was in the Diocese of Ely after the Reformation. The St Audrey of the hospital is the self-same St Etheldreda, a medieval contraction of the name. In the window, she holds Ely Cathedral as it would look some one thousand years after her death. Further west, the screen might well be the work of Cautley, installed as it was in 1934 when he was at the height of his influence as Diocesan Architect. Beyond, the chancel has an Anglo-catholic twilight feel to it, which is probably not typical of the current style of the liturgy here. Melton parish was the birthplace of one of the great unsung heroes of English urban history. Edwin Lankester was a mid-19th century doctor and social scientist. He recognised a correlation between poor water supply and the London cholera epidemics of the 1850s, and was able to show that proper sewerage and water treatment could lead to the complete eradication of the disease. It is him we have to thank for our modern plumbing systems, and he devised what is still today the standard test for the purity of drinking water. As coroner for the county of Middlesex, he was the first to insist that every death should result in a doctor issuing a medical certificate. He was howled down in parliament on the grounds of cost, but today this is standard practice. His son, Ray Lankester, was an even more famous scientist, whose brilliant work as a rationalist and zoologist was later to be misused by militant atheists. Lankester Junior was one of just eleven friends to be present at the funeral of Karl Marx, an unlikely association for a rural Suffolk parish.